INDIANAPOLIS — Just because the regular season has begun doesn’t mean that competition for starting spots is over. One of the primary focuses of training camps around the NFL are position battles. While they are largely settled in the summer heat in August, players don’t just turn off a switch when the regular season arrives and become complacent to be a backup. Indianapolis Colts second-year linebacker Anthony Walker was the first-team MIKE linebacker throughout the offseason program, OTAs, minicamps and when training camp began. However, a groin injury derailed his summer, keeping him out of the entire preseason and almost all of training camp. Undrafted rookie free agent Skai Moore took the majority of the first-team reps at MIKE in Walker’s absence and played quite well both in practice and the preseason. His sideline-to-sideline range that he showed collegiately at South Carolina and ability to stay around the ball in coverage translated to the practice field as he transitioned to the NFL. However, as the NFL regular season has returned for 2018, so has Walker, who was able to log enough practice time last week to play in the Colts’ opener against the Cincinnati Bengals. Moore earned the start — having taken the bulk of the first-team reps through the summer — but the coaching staff rotated Moore and Walker throughout the game, each receiving multiple drives. What's ironic about this storyline? Any sense of a friendly competition is nothing new to Walker and Moore, who were rivals on the gridiron back in high school in Florida (Walker, for the record, conceded Moore was better based off the fact Moore's team beat his team to advance in the state tournament). Now teammates at the highest level, however, Walker and Moore are enjoying the chance to grow their games together. “They’ve got me and Anthony rotating right now," Moore told Colts.com this week. "We’re feeding off each other, so it’s a good deal so far." By game’s end last Sunday, Moore saw 27 defensive snaps and Walker was in for 23 as well as 16 special teams plays. For Moore, receiving reps in live game action helps move his development along. You can see certain things in practice, and then totally different things against a preseason opponent, but nothing compares to getting reps during an actual in-season game. Walker is also still developing after being able to only see extensive action in two games last year as a rookie, largely due to a hamstring injury. He started the final two games of the season and tallied 22 tackles (one for loss) by season’s end. Walker is now getting the game reps to match the mental reps he’s taken all summer.  When he was drafted, one of his biggest “pros” was the fact that he was a coach’s son and acted as a quarterback on the field for the defense. Being the MIKE linebacker, you are in charge of making the on-field calls for the defense and making sure everybody is where they’re supposed to be. “Being the MIKE, whether you’re in or out, you have to know everything that’s going on; the ins and outs of the defense," Walker said. "So, when you are in, you’re able to just make the calls that need to be called for the defense and all that. Going forward, we will just have to see how the coaches proceed with Moore and Walker’s in-game reps. Are these reps for Walker just to help him get back into game shape after several weeks on the sideline? Or may we see him reclaim his starting MIKE spot? One thing for certain is it doesn’t hurt to have two sharp, young talented players calling the shots in the middle of the defense throughout the game.